To make the most of the autumn sunshine this weekend, I took a trip down to Dalston for Towpath Festival. Happening next to the Regent’s Park Canal just off of Kingsland road there was eating, drinking and music from 12pm-12am last Saturday 9th and Sunday 10th October. It was held on a strip of wasteland opposite the Towpath Cafe, for your last chance to party by the river as developers are moving in to build on the land this week. In the shisha tent hosted by Happy Hookas, you could lounge on comfy cushions whilst sipping one of the fragrant teas being served. If you wanted something harder, the Towpath Cafe had an extra stall across the river from their permanent premises serving berry cocktails. 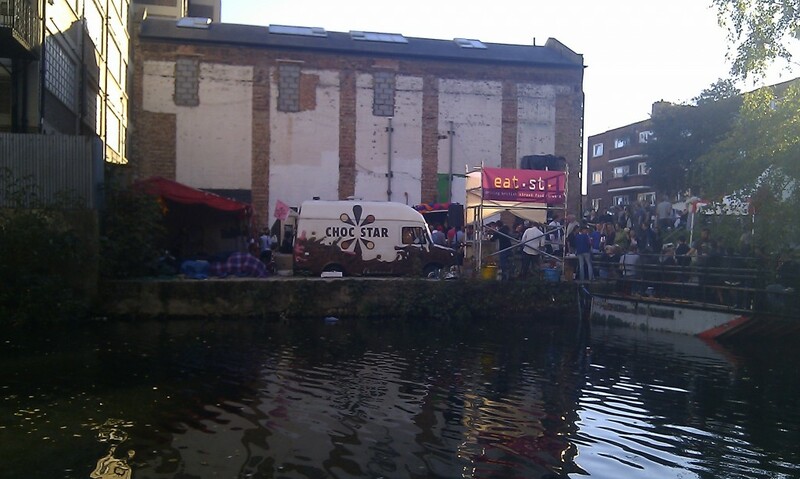 There was also food available from guerilla eateries The Meat Wagon, Jamon Jamon and Choc Star. This event was free, but donations were collected at the gate for War Child , a charity which raises money for education in warzones. This came up as a retweet from Fuckyeahhackney on Twitter so checked it out. I’m a City Newspaper student and as it falls in my patch thought I’d go and check it out, our great City minds must think alike! Went down on Sunday, anyway and thought it had a really great vibe. Thanks for your comment Steve. Hows it going on Newspaper? It’s a shame we don’t get to see other disciplines very much – maybe a big social is in order. Where do you live in Hackney? I’m just down the road from Dalston in Newington Green. Went to the opening of a new club in Dalston last weekend – The Nest. Great little place with some great music. You should check it out.